Many new anti-cancer drugs inhibit proteins that are essential for the proliferation of cancer cells. One example is ibrutinib, an innovative therapy for chronic lymphocytic leukemia first approved in 2014. Chronic lymphocytic leukemia is caused by uncontrolled growth of cells from the immune system. It is the most common leukemia in the Western world. Ibrutinib breaks the circle of rampant cell proliferation and allows even patients with high-risk chronic lymphocytic leukemia to survive for many years. However, patients must keep taking the drug every day and endure side effects, often severe, including fever, pain and fatigue. To improve the treatment of chronic lymphocytic leukemia toward higher efficacy and fewer side effects, scientists are increasingly exploring combination therapies. Ideally, such drug combinations exploit vulnerabilities that ibrutinib induces in leukemia cells, with the ultimate goal of hitting the leukemia in a hard enough way to later make treatment unnecessary. To speed up the search for promising drug combinations, a team of scientists at CeMM Research Center for Molecular Medicine of the Austrian Academy of Sciences and the Medical University of Vienna developed a method that can effectively sift through a large number of possibilities and identify those drug combinations that have true potential. The work describing the outcome was published in Nature Chemical Biology on 28 January 2019. 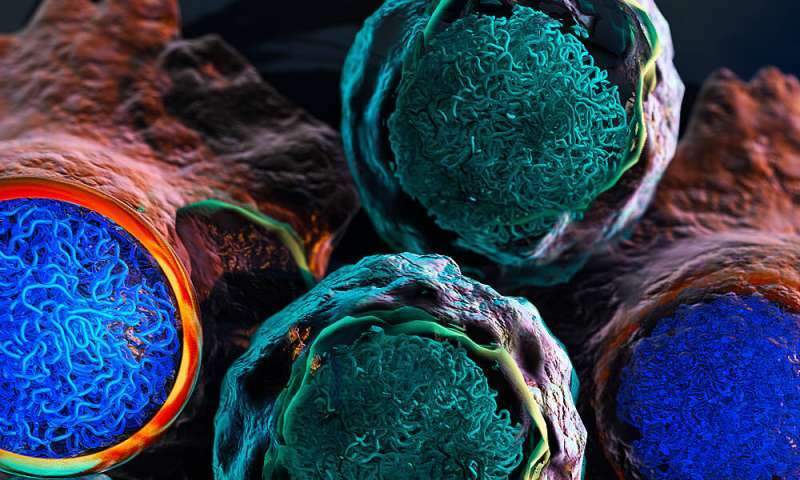 The new approach combines epigenetic analysis using a method called ATAC-seq (pronounced "attack-sec") with comprehensive testing of single-cell drug sensitivity. This approach identified characteristic epigenetic changes in leukemia cells for patients undergoing ibrutinib treatment. The scientists performed high-throughput imaging via automated confocal microscopy to identify drug sensitivities that were specific for these leukemia cells and not for healthy cells of the same patient. All of these experiments were done on primary samples collected from patients before and during ibrutinib treatment, which enabled a systematic analysis of ibrutinib-induced drug vulnerabilities. Christoph Bock, principal investigator at CeMM and corresponding author of the paper emphasizes the relevance for personalized medicine: "To keep a cancer at bay, it often takes several drugs at the same time. The search for such combination therapies unfortunately involves a lot of trial and error. This is why we have developed a method that predicts and prioritizes what is likely going to work. The first results in chronic lymphocytic leukemia are promising, and I am convinced that our method will help develop personalized therapies for leukemia and other cancers." Ulrich Jaeger, professor of hematology at the Medical University of Vienna and head of the Clinical Department for Hematology and Haemostaseology at the Vienna General Hospital, highlights the medical context of the new method: "Treatment of leukemias with single drugs carries the risk of resistance and failure to respond. A new method to develop combination therapies more systematically indeed constitutes an important advance for cancer research." Giulio Superti-Furga, scientific director at CeMM and professor for medical systems biology at the Medical University of Vienna says, "The study is a beautiful example for translational medicine and the impact of basic research on clinical praxis. In summary, it provides a powerful method for the rational development of combination therapies and a step toward truly personalized oncology." The study "Combined chemosensitivity and chromatin profiling prioritizes drug combinations in CLL" was published in Nature Chemical Biology on 28 January 2019.